In a business world of nonstop change, there's only one way to win the game: Transform it entirely. This requires a revolution in thinking – a steady stream of disruptive strategies and unexpected solutions. In Disrupt, Luke Williams, executive director of NYU Stern’s Berkley Center for Entrepreneurship and Innovation and clinical associate professor of marketing and innovation, shows exactly how to generate those strategies and deliver those solutions. This book reflects Professor Williams' experience creating breakthrough solutions at frog design, one of the world's leading innovation firms. Professor Williams shows how to combine fluid creativity with analytical rigor in a simple, complete, five-stage process for successfully disrupting any market. Readers will learn why the most unexpected ideas draw the least competitors – and offer the greatest potential. Then, using many examples and a case study, readers will walk through every step of transforming disruptive ideas from conception to breakthrough business strategy. 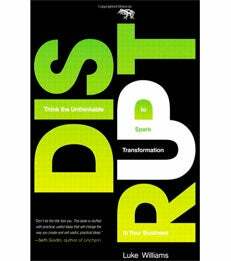 Select Chapters from "Disrupt: Think the Unthinkable to Spark Transformation in Your Business"
"Disruptive Thinking: The Revolution Is in Full Swing"
"Crafting a Disruptive Hypothesis: Be Wrong at the Start to Be Right at the End"